Rediff.com » News » When will IAF pay HAL its pending bill? When will IAF pay HAL its pending bill? Despite pending payments of over Rs 20,000 crore, HAL revenue grew 6% against the previous year. 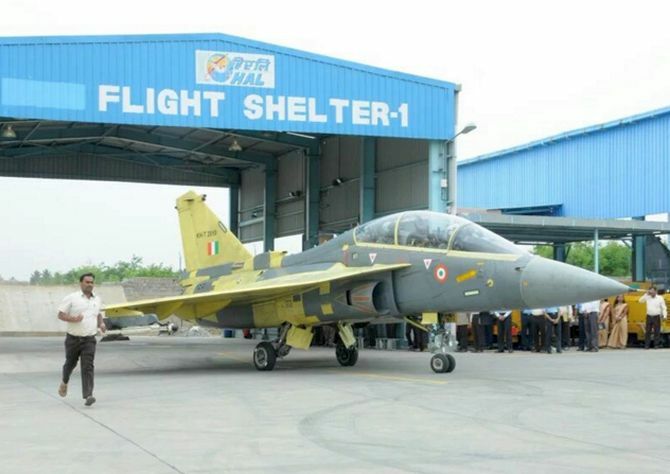 Hindustan Aeronautics Limited, which has faced concerted criticism over the past year from both the defence ministry and the Indian Air Force, has announced a record turnover of over Rs 19,400 crore (provisional and unaudited) for the financial year that ended March 31. This amounts to 6% revenue growth over the previous year's turnover of Rs 18,284 crore. That comfortably beat the revenue growth of 3.8% during 2017-2018. However, the IAF still owes HAL about Rs 20,000 crore in unpaid dues for aircraft delivered and overhauled and for milestone payments due. In January, HAL had to take a bank loan of Rs 781 crore to pay salaries to its 29,000 employees. At the time, HAL Chairman R Madhavan had said: "The IAF owes HAL money for aircraft, helicopters and services that we have already delivered. Current dues are at Rs 15,700 crore and will rise to Rs 20,000 crore by March 31." Madhavan's projection has turned out to be accurate. HAL sources say they built 11 Sukhoi-30MKI and seven Tejas fighters in the year just gone by, as well as five Dornier-228 aircraft, three Cheetal light helicopters and 15 Dhruv advanced light helicopters, totalling 41 aircraft. In addition, it has overhauled 15 Sukhoi-30MKI (up from 11 the previous year) and several Mirage 2000 and Jaguar fighters, Kiran trainers and a large number of helicopters. Amongst the research and development projects under way in HAL are the Tejas Mark 1A fighter. HAL is also claiming a breakthrough with the HTT-40 basic trainer aircraft, which it expects to certify this year. 'HAL's R&D projects are on track and are tailor made for the requirement of the armed forces,' the company said on Monday. Senior HAL executives say that more than an 'excellent' rating, the company requires cash to meet its monthly running expenditure of Rs 1,300 crore to Rs 1,400 crore. Traditionally, cash-rich HAL has, over the past five years, transferred Rs 11,024 crore to the government. This included Rs 6,393 crore to the government in an equity buy back scheme. HAL made this payment in two tranches -- Rs 5,265 crore in 2015-2016 and Rs 1,128 crore in 2017-2018. During this period, HAL also paid the government dividend and taxes worth Rs 4,631 crore: Rs 1,041 crore for 2013-2014; Rs 576 crore for 2014-2015; Rs 755 crore for 2015-2016; Rs 963 crore for 2016-2017; and Rs 1,295 crore for 2017-2018. Masked by the healthy turnover, HAL executives are worried about the impending closure of one of its most lucrative lines -- the production of Sukhoi-30MKIs at Nashik. Two years down the line, HAL would have delivered all of the 222 Sukhoi-30MKI fighters that are on order, with no production to replace the Rs 4,000 crore to Rs 5,000 crore HAL makes annually from building about a dozen fighters. Is Modi govt weakening HAL?